*READ THIS* The contents of this article, written in 2014, could be outdated. Check out our Facebook Promotion Guidelines page for current info. Back in early August, Facebook announced several updates on their developer blog including an update to their platform policy that affects third-party apps built on their platform. If you haven’t already, read Facebook’s official blog about the changes and the following discussion here. We blogged in-depth about these Facebook platform policy updates in a previous post where we discussed what these updates meant, how they’ll affect Rafflecopter, why the changes were being put into place, and what to expect moving forward (Update 11/15 – read about recent updates pertaining to fan-gating here). We’d like to take this time and discuss how these updates will affect Facebook & Rafflecopter alike, and more importantly give you a timeline in which changes to our app will be implemented so you can plan your holiday promotions accordingly. While we discussed the changes that Facebook will be making in our last blog post about this subject, let’s quickly highlight the updates that Facebook have put into place. The biggest change to the platform policy that we’ll focus on are updates surrounding the ability to incentivize people using social plugins to like a page. To describe what this means, we’ll use our Facebook giveaway app as an example. Right now, when you run a giveaway on Facebook with our app, you’ll install our app to your page, which will place the Rafflecopter widget on a fan-gated page. That means if you’re a fan of the page where the giveaway is, you’ll be able to see the giveaway widget instantly. If you’re not a fan, our app will show an image that asks you to ‘like’ the page to access the giveaway. As a third-party developer, Facebook gives us a toolbox that makes it possible for us to build an app on their platform. In order to build the fan-gate functionality in our app, one of the tools they give us access to makes it possible for us to serve the fan-gate to folks that aren’t a fan of your Facebook page yet. On November 5th, Facebook is taking this ability out of their toolbox for all developers, so even if we wanted to fan-gate our app, there wouldn’t be any way to tell who is a fan of your page and who isn’t. With these new rules in place, there will be two changes to the Rafflecopter platform: the Facebook giveaway app’s fan-gate will be removed and the “Like a Facebook page” entry option will be phased out. The first thing that will change is the fan-gate on our Facebook app. You’ll still be able to run giveaways on Facebook, but the fan-gate feature will be removed. Because of that, both fans and non-fans will be able to access your giveaway when it’s installed to your Facebook page. On November 5th, these changes to the Facebook platform will take place. 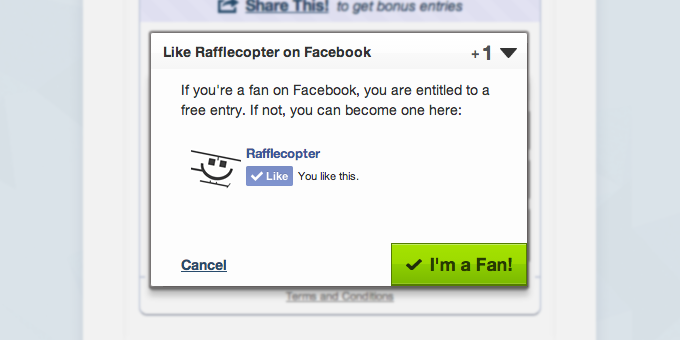 As such, starting on 11/5, the ability to have a fan-gate on your Rafflecopter Facebook giveaway will be removed. If you’re running a giveaway that lasts through November 15th, the fan-gate will remain active through 11/5. On 11/6, the giveaway will continue to run normally, but the fan-gate will disappear. Non-fans will be able to access your giveaway the same way as your fans will be able to. Second, the ‘Like a Facebook page’ entry option will be removed as well. According to Facebook’s new policies, this would fall under the rule of “incentivizing people to use social plugins or to like a Page”. 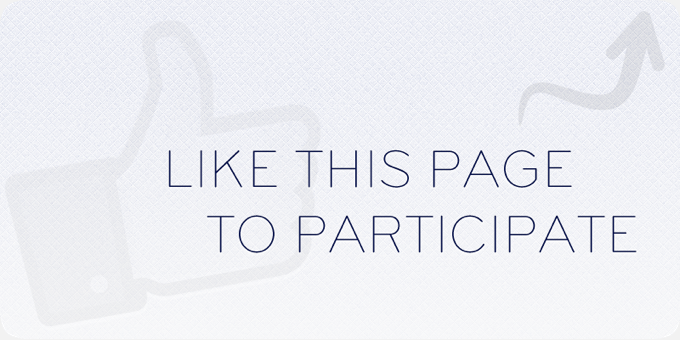 Starting on 11/5, the ability to add a “Like a Facebook page” entry option on any new promotion will be removed. However, if you’re running a giveaway that was created before November 5th that lasts through November 15th for example, the entry option will remain active through the end of the promotion. All other aspects of our platform (Facebook flash giveaway app, refer-a-friend entry option, etc) will remain the same. *Psst* A Call for Beta Testers! If you have any questions about the way these updates will be rolled out, please don’t hesitate to leave a comment below this post! If you’d prefer to contact us directly, you’re also welcome to email us at support@rafflecopter.com as well. From a user or fan standpoint, their changes are fine, from a marketers standpoint, they make getting fans that you can market to going forward more difficult. I wish facebook would pay more attention to the “like groups” that have thousands of members and ban them from their site. What this does is make it pointless to have a contest or promotion on facebook where votes are required. They could spend some time and clean up bogus accounts for the same reason. Punishing the marketers is stupid…punish people who abuse the system first! I like SOME of the changes, but not all of them. If you can’t incentivize people to “like” your page, then there’s – well, no incentive to “like” your page! You don’t have to be a fan of a page to read its content, so what’s the point in liking a page at all? Depending on what kind of incentive is being offered, that’s not “artificial”; it’s NORMAL The majority of people don’t just go around telling all their friends about all of the stores they shop at, either. When businesses offer incentives, referrals go up. It’s the same idea. The cynic in me says that Facebook’s OTHER recent changes to Page functionality have not resulted in improvements to the reader experience – they’ve only resulted in Page owners’ having to PAY for functionality they didn’t have to pay for before (like, say, having fans actually SEE their posts) – so this is probably not much different. The Facebook developers probably have a long-term pan to start allowing fan-gating – for a fee. Like Rachel , I’m also very jaded when it comes to Facebook. Suppose every single one of your 1,000 fans is a TRUE fan, and liked your page out of pure adoration, with no incentive whatsoever. Facebook acts like they want to reward and encourage this, when in fact, most of your fans won’t even see you on their newsfeed. Facebook will ask you to pony up some dough just to get equal time, and even that’s not guaranteed. I know too many businesses who paid to promote posts and saw little, if any, improvement. Those changes is part of the reason why I signed up with Rafflecopter. Why pay the monthly fee if we are no longer able to take advantage of the features facebook is removing? What is Rafflecopter doing to make up for this loss. I’m paying for a service that will now not allow me to have people “like” my page. when the change come in can we still have the option to have ‘like a post’ or ‘comment on a post’ on facebook? or will this be against the rules? i would like to know the same thing! Me too. Is there any answer to this? Good call – didn’t see this question earlier! Yes – you can still have entrants ‘like a post’ or ‘comment on a post’. That’s still possible. Part of the problem though is that it’s difficult to track freehand if a user has commented or liked a post, especially if you have hundreds of comments. I have a question about the “Liking a Facebook page as an entry option”. You write that it will still be availble in GA’s which started before Nov 5 and end after Nov 5 (e.g. the 15th). I’m happy that RC is still offering it then, but aren’t we (bloggers, for instance) breaking the new FB rules if we still have that entry available on say the 6th? Can FB shut our page down for it? That’s what I’m wondering too…..is this something that Rafflecopter is offering or is this something that Facebook will honor as well – as they’re the ones that can shut our page down. Did this information come from Facebook? Just because a giveaway form offers it, doesn’t mean it’s allowed (like the platform that offers Google+ follows as an entry option….). I do have giveaways slated to start before 11/5 that I still have a FB like for….but I would love to know if this is absolutely allowed. Thanks! One more way for FB to strangle out visibility to pages and try to force everyone to only use their advertising methods. They already filter pages out of timeline feeds for people that have “like” a page and then want you to pay $$ in “advertising” to be seen by your own fans. Just lame. Our lawyers advised us that using social sharing to gain additional entries to a contest makes the contest illegal in many states since it constitutes “consideration”. The best way to solve this is to provide an alternate “free” means of entry. But Rafflecopter does not offer this. Has anyone else given this serious consideration and how are you dealing with it? You know, I’ve seen sweepstakes by large companies…repeated ones like the monopoly one at McDonalds, where YES, you can mail in for a free entry, but you also can buy as many cokes or burgers and get extra game pieces that way (same with all the giveaways and such on cereal boxes and so forth). In other words, you can get a free entry, but the extra entries that you got from purchasing more products seemed to be legal (I mean, I’ve never heard of them getting sued over that, and they’re still doing it). So what’s different about offering a “FREE” entry on a rafflecopter form and then having someone do something (also free) for extra entries? I’m not discounting what your lawyers said, and thank you so much for sharing that, but I’m just wondering what makes that different? Or is it different? Question…in regards to the rule that “You must not incentivize people to use social plugins or to like a Page. This includes offering rewards, or gating apps or app content based on whether or not a person has liked a page.” Does this only apply to giveaways that are run ON FACEBOOK? In other words, if the giveaway is on your blog and not hosted on facebook, is it still against their rules to give a reward for someone liking your page? Because of that, I’m closing the comments section here, but we’ve added a comments section to the new page above so feel free to add to the conversation there. I wanted to avoid people reading comments that were outdated. Thanks!